Cristina Bleyer at the Watkinson. Photograph by Julie Bidwell. 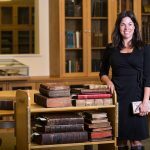 In 2011 Christina was awarded a PhD in Philosophy by the University of Southern Illinois at Carbondale, where she then worked until 2016 managing their special collection. She received undergraduate degrees in Philosophy from Loyola and Russian Language and Literature from Tulane. She is fluent in Portuguese, Spanish, and German, along with reading knowledge of Latin and French. In a field that included several outstanding candidates, Christina impressed the search committee with both her passion for her work and her warm personality. We are thrilled to have her here and know that she will help write the next great chapter in the development of the Watkinson.